The Rubik's Cube (also spelled Rubick's Cube, or Rubix Cube) is one of the most puzzling toys of all time. It ranks as one of the most cherished 80s icons and few people have ever claimed to solve it on their own, not even warlocks. In fact, most solutions have come from mathematicians using group theory. But the cube is solvable. Trial and error will get you nowhere, so below is a 7 step process that will get you to sweet, sweet resolution. And if you find this page helpful, feel free to click on any of the ads. Using this method, even a certified idiot can solve a Rubik's Cube in seven basic steps. Note the diagram to the right. Each face of the cube is assigned a letter. During the following steps, specific faces require a sequence of twists (or quarter turns). The letter "i" means inverse, or counter-clockwise twists. For example, in the following sequence Ri U Fi Ui, you would rotate the Right face counterclockwise a quarter turn, the Upper face clockwise a quarter turn, the Front face counterclockwise a quarter turn, and the Upper face counterclockwise a quarter turn. Before you start each move, make sure your thumbs are on the Front side of the cube to ensure consistent orientation for all the sequences. To turn a face in the right direction, imagine that you are facing that side of the cube. If you mess up along the way, just restart from Step 1. Let's begin. To solve the green cross, you have to solve the green edge pieces on their own. This should be easy to figure out on your own. Should you ever have an edge piece in the correct place but flipped the wrong way, use this step to flip it without affecting the other three green edges: hold the cube with the piece in the upper-right position as in the diagram, and do the sequence Ri U Fi Ui. The edge piece should now be solved, and you can work the next edge piece until the cube looks like the right diagram below. Find the corner piece in the bottom layer that belongs on top. Turn the bottom layer until the piece is directly below its home in the top layer. Hold the cube with the piece on the lower-front-right and its home at the upper-front-right and then do the sequence Ri Di R D 1,3, or 5 times until that corner is solved. If you find a corner piece that's already in the top layer but the wrong spot or flipped the wrong way, hold the cube with the piece in the upper-front-right position and do Ri Di R D once. Now the piece is on the bottom and ready to be solved using the Ri Di R D sequence. Flip the cube so green is on the bottom. Find the yellow-red edge piece. If it's on top, turn it so it matches one of the diagrams below. Then do the corresponding sequence to solve it. If the red-yellow edge is somewhere in the middle layer but it's in the wrong place or flipped the wrong way, hold the cube so the edge is in the front-right position and do either sequence once: U R Ui Ri Ui Fi U F or Ui Fi U F U R Ui Ri (This may require that you rotate the cube to a new face). After the move, the piece is in the top layer and you can solve it as described above. Repeat for the other 3 middle-layer edges. Turn the top layer until the edges match one of the diagrams. Repeat the following sequence as many times as it takes to get a blue cross: F R U Ri Ui Fi. Hold the cube with red in front. Turn the top layer until the red and blue edge piece is solved as in the diagram, and then repeat the following sequence until the yellow and blue edge piece is also solved on the right side: R U Ri U R U U Ri. Now turn the whole cube so that white is the front face. If the top white edge isn't solved, do the sequence again followed by and extra U. Find a corner piece that is in the right place and hold the cube with that piece above your right thumb. Don't turn the top layer at all, as it well mess up all the effort from Step 5. Do the following sequence once or twice to put the rest of the corners into place: U R Ui Li U Ri Ui L. If you can't find a corner piece in the right place, just do the sequence once before you start. You're almost done, you beautiful mind, you. Hold the cube with the red in front. Keep turning the top layer until the upper-front-right-corner needs to be flipped to have blue on top like in the diagram. Do the sequence Ri Di R D 2 or 4 times to get blue into position. The cube will get scrambled in the process, but don't worry. With red still in front, keep turning the top layer and repeating the sequence to flip the upper-right-corner pieces. Congratulations, your cube is solved. If it didn't work, give up and crawl into a hole. No one will think worse of you. Erno Rubik was born in Budapest, Hungary during World War II. The son of a poet and aircraft engineer, Rubik studied sculpture in college. After graduating he pursued architecture, eventually becoming an interior design instructor. Rubik's attraction to inventing the Cube was appropriately structural: Could connected blocks move independently without falling apart? This question led to invention of the cube in the spring of 1974. It's an ingenious mechanical invention whereby the parts (cubies) are highly mobile while being interconnected. The cubies are divided into 3 groups: six center cubies that maintain stationary on a six-fold spindle, twelve edge cubies, and eight corner cubies. All but the center cubies, which are actually facades, are fundamentally cubes. At the time, even the Rubik was unsure if he could return the cube to its starting position. But within a month, he had the puzzle solved and was ready to unleash the device upon the world. Rubik applied for a Hungarian patent in January 1975 and began producing his invention through a small toy making cooperative in Budapest. The patent approval finally came in early 1977 and the first Cubes appeared at the end of 1977. The first Cubes appeared on the shelves of the Budapest toyshops. In the two years following, without any promotion or publicity, the Cube began very slowly to make its way through the hands of fascinated youths into homes, playgrounds and schools. It could seen occasionally in the street, on trams, in the cafes, each time in the hand of someone turning and twisting and completely absorbed. Rubik's Cube was introduced in the U.S. in 1980 and soon thereafter became a worldwide phenomenon. It is estimated that by 1982, over 100 million Cubes had been sold. Sales slowed in the mid-Eighties, but are on the rise again. 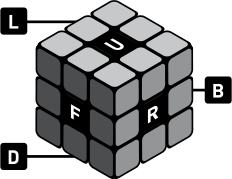 Although possibly the most original of all invented puzzles, Erno Rubik's Cube was not born in a vacuum. Its antecedents include: the Tangram from ancient China which consists of 5 triangles, a square and a parallelogram; the Pentomino, invented by Solomon W. Golomb, which has 12 different elements made up of five square joined together; and Sam Loyd's well known 15 puzzle with it's numbered tiles locked together. The Rubik's Cube is a deceptively simple-looking puzzle, but even after a few turns it is completely randomized and difficult to solve. It's a challenge that has frustrated and intrigued millions of people. There it is, even frustrating me as I type this.